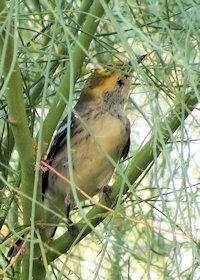 I spent about 2 hours at the Yuma West Wetlands on Saturday morning (15 Sep 12). It was the first nice morning of the season, with temperatures in the 70’s! There were more signs of falls as I found several firsts among the returning birds: two WHITE-CROWNED SPARROWS and a GREEN-TAILED TOWHEE. 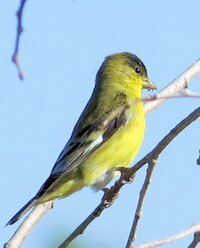 There was a huge flock of LESSER GOLDFINCHES, but I couldn’t find any Lawrence’s among them. One of the two WILLOW FLYCATCHERS from this morning was calling, making its identification a breeze. 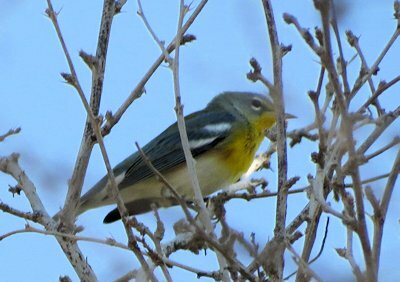 I found another NORTHERN PARULA east of the hummingbird garden “pond” and down by the river. This one was a first-year bird, as oposed to the adult we saw about a month ago close to the same location. I was surprised by the paucity of birds around the pond, until I found a Cooper’s Hawk lurking in one of the trees there. On Wednesday of last week I had my first PRAIRIE FALCON of the season on the way to work, just west of Yuma.